(Nanowerk News) Chi-Ming Yim, working as a postdoc in the London Centre for Nanotechnology (LCN) group of Geoff Thornton, has discovered an intriguing phenomenon in adsorption properties of nanoparticles. Low temperature scanning tunnelling microscopy (STM) experiments, carried out in the LCN, have allowed direct imaging of carbon monoxide molecular over layers formed on the palladium nanoparticles themselves supported on a titania substrate. Measurements of molecular orientation on a single nanoparticle using facilities at the Diamond Light Source indicate that the molecules behave in the same way as on a single crystal surface. However, with the higher spatial resolution of STM, Pd nanoparticles can be seen to grow like a carpet over substrate step-edges giving rise to a curved top facet (see Figure). Yim found that on the curved top facet of the nanoparticle, the adsorption behaviour of CO molecules is found to differ from that on single crystal surfaces. Theoretical calculations suggest that this is caused by strain, induced to the particle surface during the carpet growth. 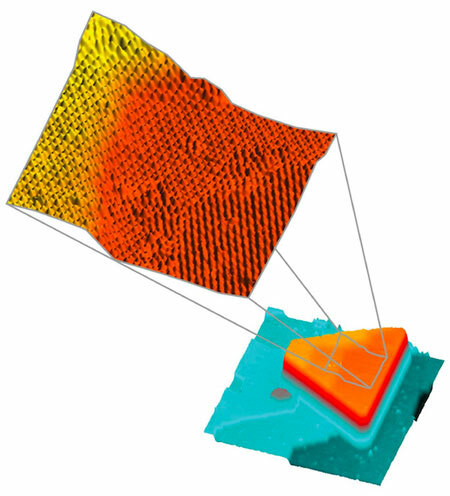 3D STM micrograph showing a Pd nanocrystal curving across the step edge of the titania support in a carpet-like manner. On the curved top facet of the nanocrystal, the adsorption behavior of CO molecules (imaged as bright features) differs from that of the single crystal surface. This result ("Influence of support morphology on the bonding of molecules to nanoparticles") has important implications beyond our basic understanding of the chemistry taking place on supported nanoparticles. This support morphology effect will have a decisive impact on the rate of chemical reactions. It also suggests a method of tuning the reactivity of multi-component systems by designing nanoparticle/substrate interfaces.